The Monster Obstacle Course is sure to benefit any party or event. This over-sized inflatable play structure has a bright and colorful theme of yellow, red and blue, perfect for high-traffic days. The Monster Obstacle Course is set up for friendly competition play, with dual entrances and exits. 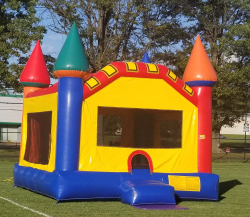 This impressive structure measures over 12'6" feet tall, and features mesh sides for easy viewing from beginning to end.This entertaining inflatable play structure can be used in conjunction with the Monster Dry Slide for even more fun! Participants exit the Monster Obstacle Course and can immediately enter the climb-side of the slide, for an awesome sliding experience! The Monster Obstacle Course inflatable play structure has a round front-loading obstacle entrance, taking participants through maneuvering pop-ups, over climbs and down the slides for exciting race from start to finish. The inflatable Monster Obstacle Course then ends with a photo-finish pair of tunnels.